IMPORTANT: Before labels can be made, your Contacts must first be exported out of PerformerTrack (as a .CSV file) that can be imported into the Mail Merge. Click here to see our steps for exporting your 'Contacts' out of PerformerTrack. Once you have exported your 'Contacts' the steps below can be followed to create labels using a mail merge. STEP 1) In Word, on the Office Ribbon click "MAILINGS"
STEP 2) Then click on "START MAIL MERGE" and then select "LABELS". 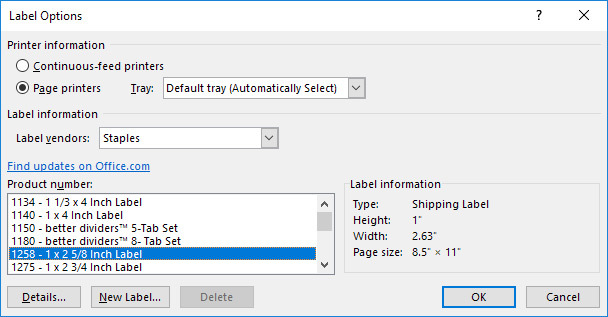 STEP 3) In the "Label Options" pop-up window as shown below in the 'Label vendors' drop down select the type of labels you are using. In our example, we are using 'Staples' labels. Finally, select the product number of the labels, this is often shown in one of the corners of the label package. Once everything has been selected click the "OK" button. STEP 3) After the labels have been created click the Select Recipients button in Mailings and then click Use Existing List. In the Select Data Source window, point Word to the location of your CSV file and click OK. If the CSV file inserts properly, you should now have <<Next Record>> on each of your labels. Next, click the Address Block Button and verify the address is properly formatted. If the address is not being displayed properly, click the Match Fields button and change how the fields are being matched. Once the address is being displayed properly click the OK button. This should put the <<AddressBlock>> field into the first label. Finally, click the Update Labels button to update all fields. The first label should have only the <<AddressBlock>> field and all other labels should have <<Next Record>><<AddressBlock>> to step through each address field and print the address block in each label. To make sure everything looks ok, click the Preview Results button, which should show each label and a different address for each label. If you want to preview more than just the first page click the arrow pointing to the right while still in preview mode to show other pages. Tip: To help prevent labels from being wasted we highly recommend that you print labels on a piece of paper before printing on the label stickers. Once the labels have been printed on paper you can hold the paper up with the labels behind the paper to a light to see if the spacing and formatting of the labels looks ok.